We’re in a celebratory mood because this Sunday, November 17, 8:00 ET/5:00 PT, we mark the one-year anniversary of our little dog-and-pony show! Huzzah! A full year of frivolity, bawdy jokes and righteous rants from my beloved, bickering masters-alleged stars Christopher Rice and Eric Shaw Quinn – as well as hilarious, thought-provoking and often emotional interviews with a wide array of fabulous party guests. 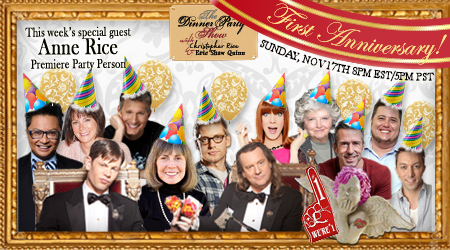 We will commemorate this wondrous event by welcoming back Premiere Party Person – and our very first guest – Anne Rice!